Your choice: small reactors or carbon reductions. You can’t have both. 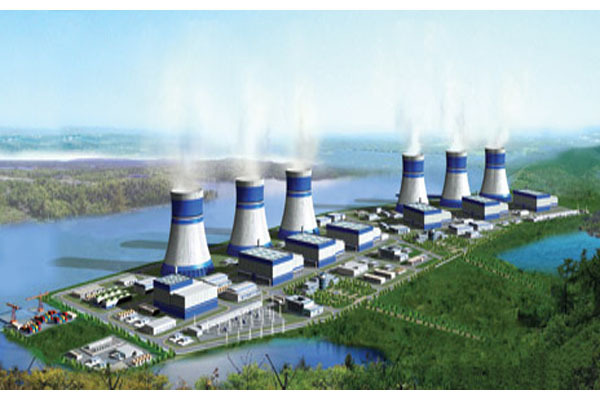 When most people think of “small” reactors, they probably don’t envision huge nuclear sites like this rendering. But that’s exactly what the nuclear industry sees as their future. Dr. Mark Cooper, senior fellow for economic analysis at the Vermont Law School’s Institute for Energy and the Environment, this morning released a major new paper asserting that large-scale development of “small modular reactors” (SMRs) likely would cost $90 Billion–an amount that likely would be diverted from development of much more cost- and climate-effective renewable energy. But it is exactly the climate issue that nuclear backers are hoping to seize on. At the same RFF meeting, Exelon’s Crane also said that states should replace existing renewable energy standards with new “clean energy standards” that would include nuclear power as part of their strategies to reduce carbon emissions under forthcoming rules expected from the Environmental Protection Agency. In reality, if such a strategy were adopted for existing reactors, as Crane desires, it would actually increase carbon emissions from what otherwise would be achievable from deployment of new renewable energy sources. In Maryland, for example, nearly all of the state’s current 20% renewable standard would be met simply by keeping the existing two units at Calvert Cliffs operating, rather than by installing new renewables. It’s a con game, but it’s one that will escalate in coming months. The full report, “The Economic Failure of Nuclear Power and the Development of a Low-Carbon Electricity Future: Why Small Modular Reactors Are Part of the Problem, Not the Solution,” is available on NIRS website here. You can now support GreenWorld with your tax-deductible contribution on our new donation page here. PayPal now accepted. We gratefully appreciate every donation of any size–your support is what makes our work possible. Ha !!! SMR’s… the nukie cheerleeders are SOOOOO desperate… The only real product of atomic energy is the radioactive waste…and all the radioactive gifts we will be burdened with for 100,000+ years.